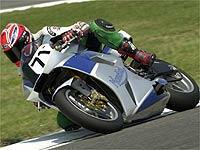 Mark Heckles stayed on at Misano after the WSB round there to test Mondial’s Piega WSB bike and the road version as part of the company’s preparations to go racing in 2003. Heckles – who rides for the Rumi Castrol Honda team on a kitted Honda VTR SP-2 in the WSB series – got the test ride because Honda is backing the Piega project and his team boss Oscar Rumi is good friends with the head of Mondial. Heckles told MCN: " It was even hotter on the Monday than it was at the weekend and it was a public trackday so there were some interesting moments! But both the race and road versions were lovely. "